Stansted was opened in 1943 as a simple airfield for the Royal Air Force and was changed to a civilian airport after the war, in 1949, but traffic remained limited to charter flights. Only after the British Government decided to transform Stansted into London's third airport that growth took off. Distance from city center: 55 km. Which airlines fly to London Stansted Airport? How many runways and passenger terminals does London Stansted Airport have? The current, modern, terminal building was constructed in the late 1980's at a cost of 100 million pounds and upgraded again in 2008. The main terminal does not have any gates, these are in three separate satellite buildings reachable by walkway or automated transit system. At the main terminal the Departures are at the back left, Arrivals at the back right after entry while Check-in and shops in the middle. Where is London Stansted Airport located? London Stansted Airport is located 55 km northeast of central London near the village Stansted Mountfitchet. Under the main terminal building is the Stansted Airport Railway Station situated. The Stansted Express departs from this station to London Liverpool Street in central London every 15 minutes and takes about 50 minutes. With 23.50 pound for one-way ticket far from cheap (but if booked well in advance fare can be as low as 7 pounds). From Liverpool Street Station you can connect to several lines of the London Underground. Scheduled express buses depart 24/7 for Stratford (45 minutes, 8 pounds), Victoria Coach Station (75 minutes, 10 pounds) and Liverpool Station (55 minutes, 9 pounds). They are cheaper than the trains but take longer. See for tickets and schedule: trains: stanstedairport.com buses: stanstedairport.com . Taxi are expensive as the airport is a long way from central London. Expect to pay at least 70 pounds for a 1 to 1,5 hour taxi ride. Better to take the train into the city and continue with taxi from there. 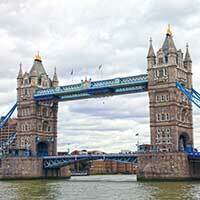 What are popular destinations from London Stansted Airport?